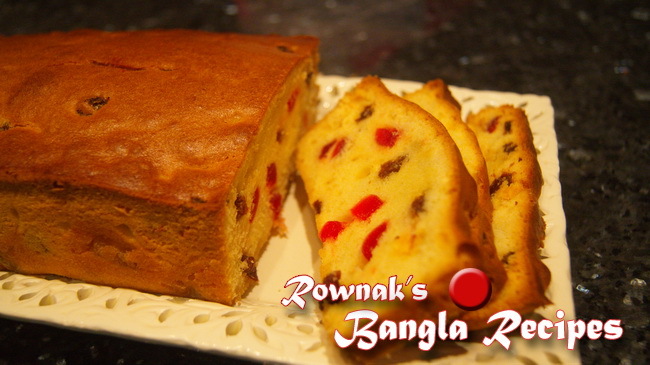 Bangladeshi Fruit Cake is actually close to lite fruit cake with raisins, glazed cherry and Ash Gourd candy. 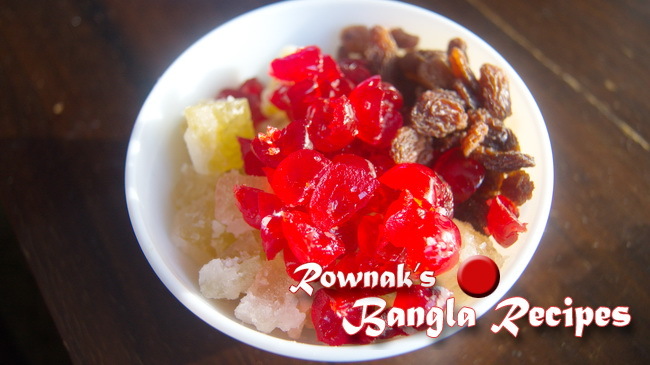 There is no fruit cake in Bangladesh without Ash Gourd candy (morobba), even morobba is vastly used in every type of cakes. Another thing is the use of ghee or missed ghee and oil. So literally there is no use of butter in baking in Bangladesh. Wish you merry Christmas and prosperous new year. Also needs loaf pan or your desire pan. 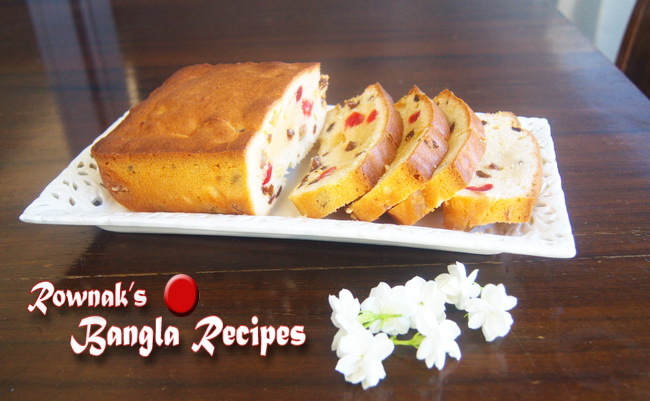 I use electric mixer to make whole process easier but you can beat by spatula. Spray or brush oil the pan and preheat oven to 180˚C. Mix sugar butter together and beat till sugar dissolve and becomes light and fluffy. Add eggs one by one and beat well. Sift flour, baking powder and salt together; gradually add in egg mixture. Pour the batter into the prepared pan and bake for about 55-65 minutes or until a toothpick inserted into the centre comes out clean. Remove from oven and let it cool for about 10 minutes before removing from pan. If you don’t have non-stick pan just brush oil and sprinkle flour over and you will your non-stick pan. 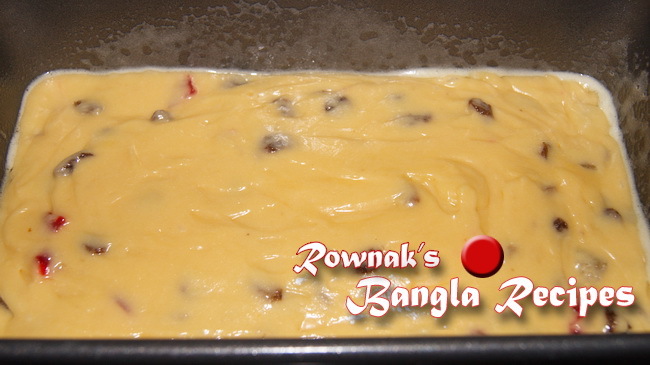 Bake cake in the centre of the oven. If you find the cake is browning too much, cover with a piece of aluminium foil. hihi its strange, I am planning to post Chiffon cake. So please keep on eyes. Thanks. Can I use liquid milk instead of powder milk? If yes,then how many ml milk is needed? If you use liquid milk, you need to use more flour. 1/3 cup milk and 1 and 1/2 tablespoon more flour will do. 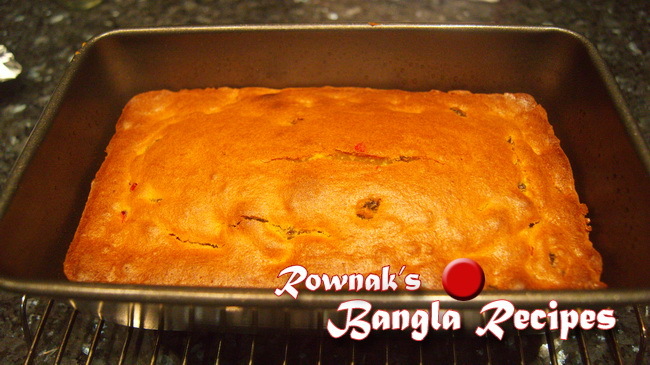 Thanks..
Two options Bake lesser time or add 1-2 tablespoons milk will make your cake moist next time. Thanks. Eta ki microwave woven a kora jabe,kora gele kotokkhon woven a rakhbo? Sorry apu ami microwave kokhono cake kori na.